A panel of federal appellate judges has authorized Texas officials to enforce a controversial abortion sonogram law while its constitutionality is being challenged in court. In an opinion, the judges said the measure’s opponents “failed to demonstrate constitutional flaws” in the measure, which they said was “fatal” to their effort to prevent it from taking effect. The abortion sonogram law, which lawmakers passed last legislative session, requires doctors to perform sonograms and describe what they see, including the size of the fetus and the length of its limbs. The measure has been in court almost since it passed, with opponents arguing it violates doctors’ First Amendment rights by forcing them to disclose information that isn’t medically necessary and that the woman may not want to hear. You can read the full opinion here if you have the stomach for it; I’m afraid I don’t right now. I thought Judge Sparks’ ruling was very well reasoned, but apparently the Fifth Circuit is fine with the idea of the state compelling doctors to say things they wouldn’t otherwise in the course of treating a patient. 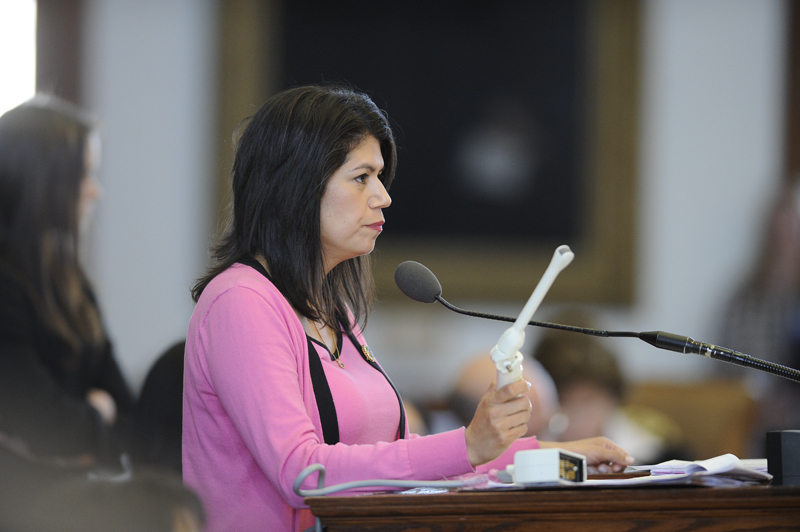 That photo you see of Rep. Carol Alvarado, holding the implement of this law, is a reminder that it’s government intrusion at its most literal. Feel free to wince; I can think of plenty of people who should be wincing right now. BOR has more, and a statement from Peter Durkin of Planned Parenthood Gulf Coast is beneath the fold. Statement from Peter J. Durkin, President and CEO of Planned Parenthood Gulf Coast, Inc. (PPGC) on the ruling. “Planned Parenthood is extremely disappointed by the 5th Circuit panel decision issued today that allows Texas politicians to shame and demean women and tell doctors how to practice medicine. Every Texan should be outraged that politicians are interfering with their most private medical decisions. “This morning a three-judge panel of the 5th Circuit Court of Appeals ruled that Texas can go forward with implementing a mandatory ultrasound law that ignores a woman’s decision, a doctor’s professional opinion and is medically unnecessary. The panel – led by a vocal anti-choice federal judge – said that adult women seeking an abortion can be forced against their will to have ultrasound images placed in front of them and have the fetal heart tone made audible, if present, for no medical reason. The court saw no problem in giving the woman no other choice but to cover her eyes and plug her ears if the woman does not want to view the images or listen to the heart tone. “This is a continuation of the ongoing assault on Texas women and reproductive health care. Led by politicians who are out-of-touch with mainstream Texans, this last session the Texas legislature slashed funding for preventive family planning health care—taking basic health services away from nearly 300,000 low-income women. “The mandatory ultrasound law is pure politics. It puts politicians, not doctors, in charge of women’s medical care. It will not reduce the number of unintended pregnancies or the need for abortion. The only thing today’s ruling does is make sure that a handful of extremely anti-choice politicians are in control of the private and personal medical decisions of thousands of Texas women. As a woman, every day in Texas, I feel like a second class citizen…. Just goes to show what type of small government Texas supports and what type of non-activist judges Republicans support.